This 3 bedroom, 2 bathroom home sleeps 9. It is a 3rd row home in the Cloon area. When your family stays at "Sea" Shed, you'll be just a short walk away from tons of fun in the sun on the beach! There is a downstairs shower to rinse off after a long day playing in the sand. Smell the salty air and listen to the sounds of the ocean while you're sitting on the deck with your favorite book or your morning coffee. There is plenty of room in the kitchen to prepare your favorite meals. Enjoy eating outside on the upstairs or downstairs picnic tables. Wifi is available so you can share your favorite vacation photos with your friends and family! You don't have to leave your fur baby at home, pets are welcome with a non-refundable pet fee. Linens available for an additional fee. This beautiful 4th row, 3 bedroom, 2.5 bath, pet friendly home that sleeps 12 is located in the popular Emerald II subdivision. This house features an open concept living, dining and kitchen area, perfect for entertaining or just relaxing. It is beautifully decorated with comfortable furnishings, and there is even a fireplace for snuggling around on those cooler weather days and nights. You'll enjoy spending your days relaxing on the large covered deck while watching the waves roll in, or downstairs gathered around the picnic table while cooking up something on the grill. 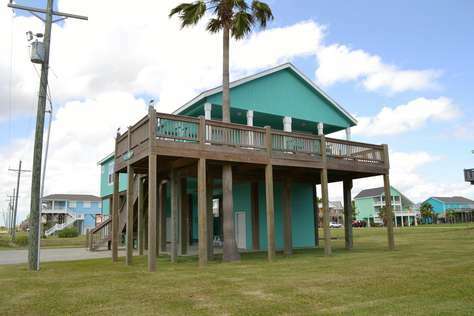 The yard is completely fenced so the kids and pet can run and play while you sit and relax, making this the perfect family vacation beach get-a-way. You are just a short walk or golf cart ride from the beach when you're ready for some fun in the sun, via the beach access road. Linens provided for an additional $120. Wonderful 3rd row with 2nd row view, 3 bedroom + loft, 2 bath home that sleeps 14 is located at the end of the street in a great neighborhood. 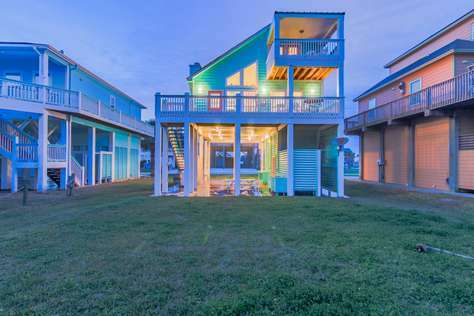 It is beautifully decorated with cool colors and coastal decor that create a relaxing beach retreat. Enjoy the open concept living, dining and kitchen area great for visiting while preparing dinner or just relax on the large deck while watching the waves come rolling in. This house has the perfect entertaining area downstairs with a lift up garage door bar area, picnic table, BBQ grill and enclosed outside shower. 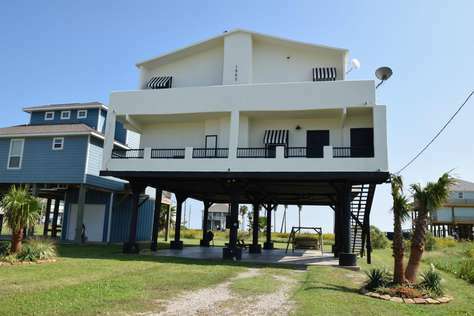 When you are ready for some beach time you have easy beach access via walking, golf cart or vehicle. Linens provided for an additional fee. This beautiful 2nd row home with beachfront views, 3 bedroom 3 bath home that sleeps 10 is centrally located near shops and restaurants, while still in a quiet neighborhood. Peaceful Cottage is a home featuring an open concept living, dining and kitchen area great for entertaining or just relaxing. You will love cooking in this large kitchen with granite countertops, stainless steel appliances and large breakfast bar. Dine indoors or head out to the deck to dine al fresco with one amazing beach view. It's tastefully decorated, has lots of natural light, comfortable furnishings, and each bedroom has it's own bathroom making this the perfect family beach vacation get-a-way. 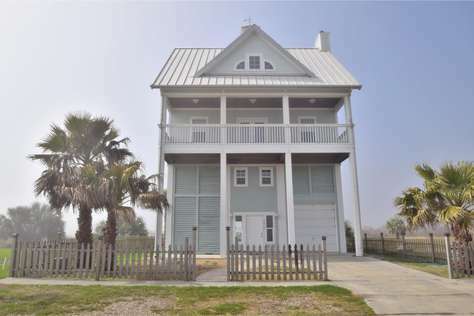 Located on the corner of a beach access road you are only steps away for the ocean. This is a very "Peaceful" place to spend your next vacation. Linens provided for an additional fee. To book this property for less than 6 nights, please contact the office. 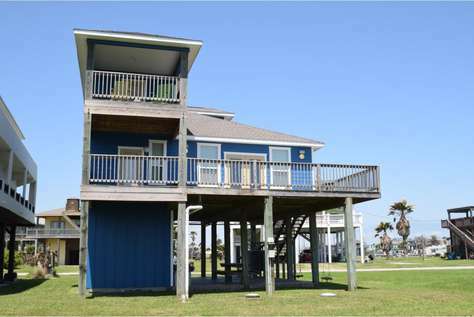 Stunning second row views of the Bolivar Peninsula and Gulf of Mexico are all yours in this 3 bedroom 2 bath home rental that sleeps 10. You will enjoy a beach access road just a few short steps from your front door! 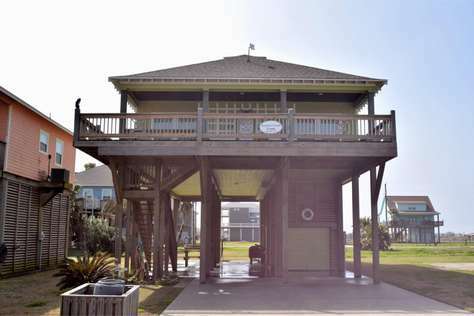 Take in the scenic vistas of Crystal Beach from the deck area for sitting and relaxing with your morning coffee or evening drink. Third floor master suite is complete with separate private balcony with spectacular beach views. The downstairs is shaded and the perfect place to enjoy friends and family complete with BBQ grill, outdoor shower, and a fish cleaning station. Step inside to open concept living, kitchen and dining areas. Vaulted ceilings and coastal décor in a soothing color palate offers plenty of natural light and a comforting ocean vibe. This home is designed for family-friendly entertaining with a cozy wood burning fireplace, central air conditioning/heating, ceiling fans, granite counter tops, stainless steel kitchen appliances, washer/dryer and a large breakfast bar. The kitchen is stocked with everything you need for entertaining inside and out. TV’s are conveniently located in main living areas and in each bedroom. Movies with DVD player, Wi-Fi access, and board games are included for recreational use during your stay. Nestled in the peaceful Emerald subdivision, local restaurants and stores are only a short drive away with this centrally located home. 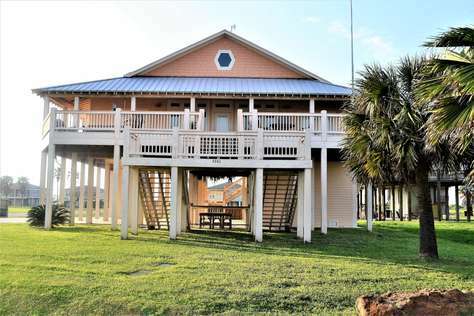 Experience value and comfort during your getaway vacation to this wonderful Texas beach that is a brief ferry ride away from Galveston. This property allows parties/events, but an agreement must be signed prior to your stay. This property has a Pack-and-play crib. This 3 bedroom, 2 bathroom home sleeps 10. It is on the second row in the Blue Water area. You'll enjoy your vacation in this fantastic home, just steps from the beach! Sit outside with your coffee in the mornings and watch the waves rolling in. The downstairs picnic table will be the perfect spot for your family dinner or for a quick snack between beach visits! There's a downstairs shower to rinse off after a long day in the sand and water. This home has cable and wifi! Linens available for an extra fee. Please Note: This home has security cameras. Unplugging the camera during your stay will result in an automatic termination of the remainder of your rental period. 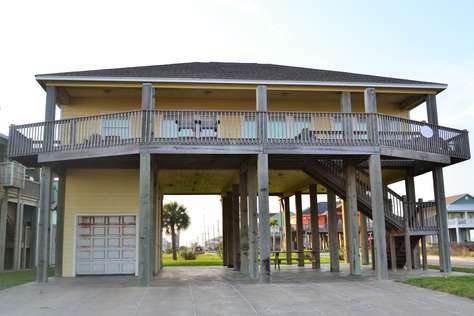 This beautiful Beachfront 4 bedroom 2 bath home that sleeps 10 is located in the Driftwood Subdivision. It features a gated private walk over to access the beach from the front yard. This home has unbeatable views and lots of natural light that comes from the wall of windows facing the beach. In this home you will find everything you are looking for and then some, the kitchen is spacious with stainless steel appliances, granite countertops and plenty of space for entertaining. The living room has comfy furnishings along with a fireplace just perfect for those cold weather days and staying inside with a good book or just taking in the view. The master bedroom has access to a private deck for enjoying your morning coffee or an afternoon beverage of your choice, making this the perfect "Beachside Retreat". Linens provided for an additional fee. 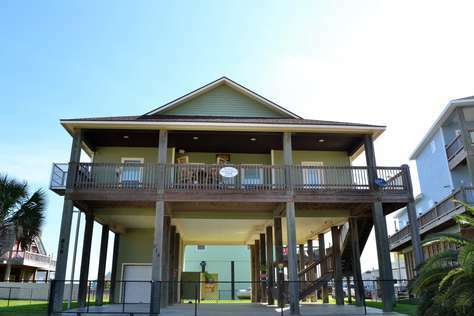 This 3 bedroom/2 bathroom home with 2 lofts sleeps 12. It is in the Noisy Waves area. 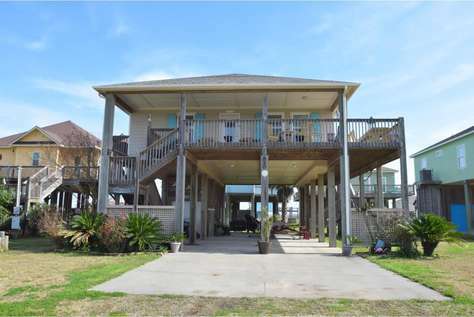 Your family will have a lot of space in this large beach side home! The living room opens to the kitchen and has plenty of room for everyone. 2 loft areas give you plenty of room to spread out. Feel the breeze from the deck or enjoy the screened in porch with your coffee or your favorite book. Enjoy lunch on the picnic table downstairs in between your trips to the beach. It's just a short walk or golf cart ride away! Nice 3 bedroom/ 2 bath located in the Bluewater Area. 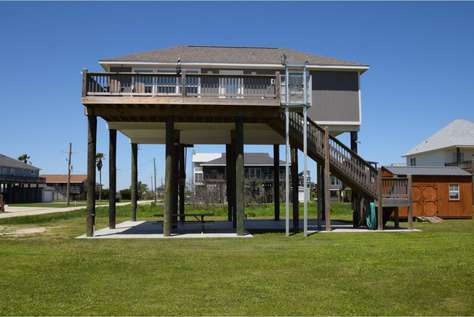 Easy beach access via waling, golf cart, or vehicle. 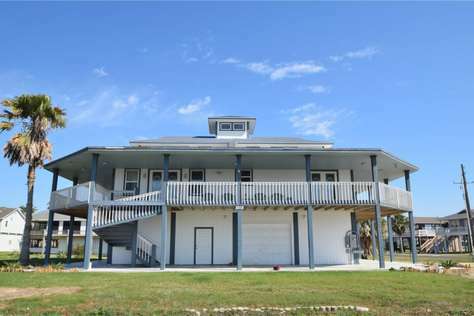 You can sit on the front deck and see the ocean even though this home is a little farther from the beach. Great for families to share memories. Open floor plan so everyone can visit while cooking. Great area downstairs for sitting and enjoy the afternoon while cooking burgers or steaks. There is an additional parking area to accommodate a boat or trailer. The children can play a game of basketball on the concrete area which contains a basketball goal. Come and enjoy great times at Casa Carmen. SLEEPS 9. Small Pets allowed, with payment of non-refundable pet fee. Linens provided for an additional fee. 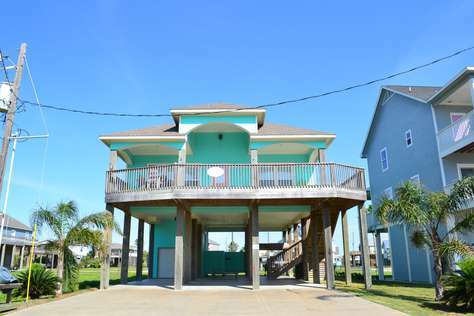 This 2nd row, 3 bedroom, 2 bath home with beachfront views is located in a quiet subdivision on a beach access road! This home has an open concept living, dining and kitchen area great for entertaining or just relaxing. The kitchen features, granite countertops, stainless steel appliances and large island. Tastefully decorated with lots of natural light, this home is sure to be a favorite family vacation get-a-way. You can enjoy your mornings on the deck while watching the waves come crashing in. When you are ready for some beach time, it is a very short walk to the beach via the beach access road. Linens provided for an additional fee. This 4th row, 3 bedroom, 2 bath home that sleeps 9 is located in the Emerald II subdivision only 100 yards from the beach. This house has all the amenities you could want and then some such as a Surf bar "Barmsmear" downstairs, a 5 burner gas grill, outside stereo (iPod compatible), Free Wireless Internet, satellite TV with Bluray/DVD and memory foam mattresses. You're sure to enjoy cooking in the spacious gourmet kitchen with it's custom cabinets, granite countertops, stainless steel appliances and large breakfast bar. The open concept has stylish décor and comfy furnishings making this the perfect family vacation home. 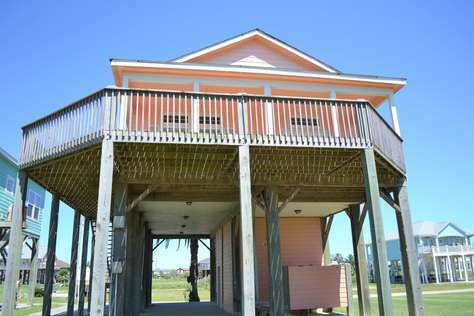 Enjoy your days sitting on the deck, hanging out downstairs or on the beach via the beach access road. Linens provided for an additional fee. 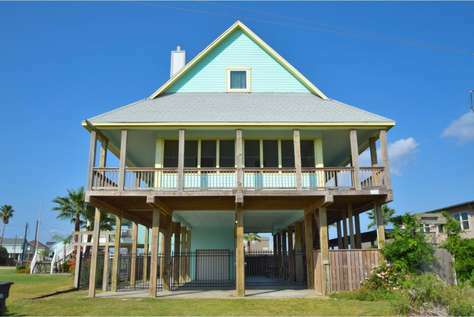 This great 3 bedroom, 2 bath beachfront home that sleeps 10 is located in the quiet neighborhood of Gulf Cedar. This home features an open concept living, dining and kitchen area that is tastefully decorated with comfortable furniture, . 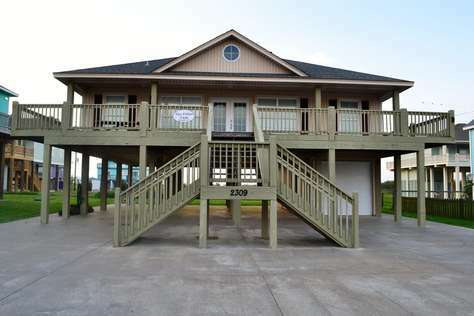 This is sure to be a family favorite vacation get-a-way where you can enjoy the spectacular beach views from any room in this house, or while sitting on the deck. The large area downstairs is great for entertaining or just relaxing while cooking out on the grill, and when you are ready for some beach time there is a private neighborhood walkover. Linens provided for an additional fee. This 2 bedroom, 1 bath, pet friendly home (with a non-refundable pet fee) is centrally located. Hidden Treasure is an affordable family friendly beach vacation get-a-way that features an open concept living, dining and kitchen area. The spacious bedrooms are full of natural light. You can sit and relax on the deck with your morning cup of coffee or an afternoon beverage of your choice. When you are ready for some beach time, it's a short drive via the beach access road right off Hwy 87. Linens provided for an additional fee. Please note, the mapping on vrbo is incorrect. Hidden Treasure is located near the post office, by the Gulf Shores subdivision. This is a 4th row, 3 bedroom 2 bath home that sleeps 9. It is beautifully decorated with coastal accents. It features an open concept Living, Dining, and Kitchen area great for entertaining or just relaxing. 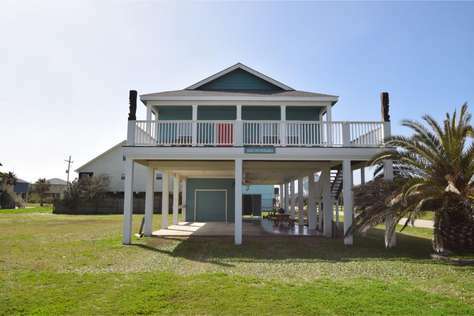 This fully loaded beach home has all the comforts of home and is only a short walk to the beach. You can sit on the large deck and enjoy the wonderful Bolivar sunrises with your morning cup of coffee, or hang out downstairs in the evening with your beverage of choice while you cook out on the BBQ grill. Linens provided for an additional fee. 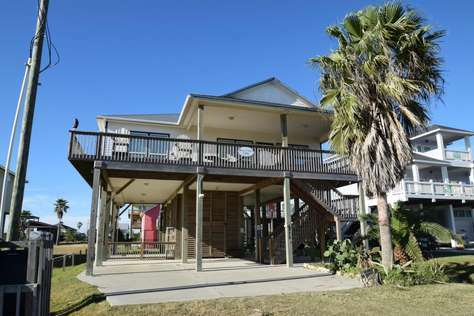 This nice 3 bedroom/ 2 bath home which sleeps 10 is located in the heart of Crystal Beach. 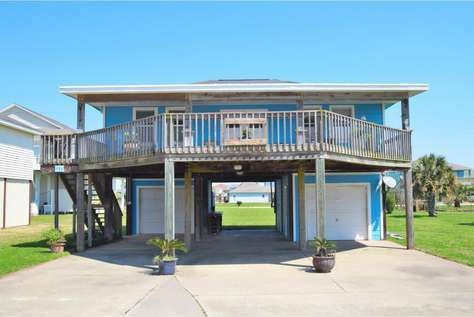 It has a nice covered deck with beach views as well as a large area downstairs for entertaining after a long day at the beach. You can feel the sea breeze blowing while sitting on the deck.It's the perfect spot to relax with a good book or cup of coffee in the morning. There is plenty of room for your family to enjoy your beach vacation. Easy access to the beach via a golf cart or vehicle. Linens available for an extra charge. La Maison Bleue is a 3 bedroom 3 bathroom home that sleeps 8. It is located in Gulf Shores subdivision. Just wait until you see the views from this beautiful beach home! Enjoy a cup of coffee in the morning on the deck and enjoy the sights and sounds of the ocean. Cook dinner for your family in the well stocked kitchen and enjoy an evening inside with the beautiful beach decor. When you go to the beach it's just a short drive or walk. After spending a long day at the beach, wash off in the downstairs shower. You're sure to remember your time at La Maison Bleu for years to come! Linens provided for an additional fee. Very cute, comfortable open-concept with 1 bath located bayside on a direct beach access road across Hwy 87. Sleeps 4. It is located in a quite neighborhood. Makes a great weekend get-away for a couple to come and relax. You can sit on the porch swing in the afternoon to watch the beautiful sunsets or the morning sunrise. SLEEPS 4 Open - Concept: 1 Full Futon and 2 Twin Linens provided for an extra $85.00 charge. 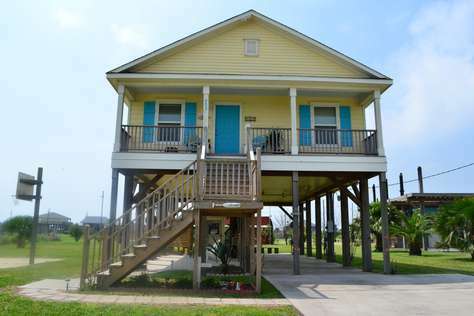 This is a 3rd row, 3 bedroom 2 bath home that sleeps 8 and is located in a family friendly area of the beach. Enjoy the awesome views from the deck with your morning cup of coffee or in the afternoon with a nice glass of wine. Molly's Place has all the amenities of home with tile floors throughout, large kitchen and spacious bedrooms. Sure to be a favorite family beach get-a-way, it features an open concept, is light and bright and tastefully decorated. 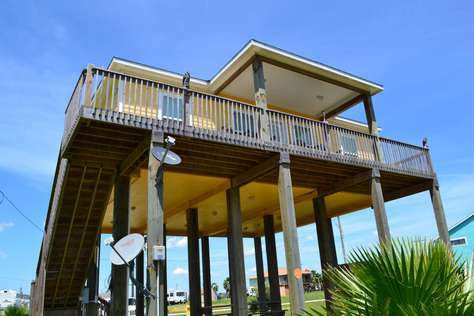 When you are ready to head to the beach, it has easy access via the beach access road. Linens provided for an additional fee. This large 3rd row, 4 bedroom 3 bath home sleeps 14 is located in a quiet subdivision. Perfect for your next beach get-away, this home is beautifully decorated with stylish coastal décor, has lots of natural light and comfortable furnishings. Enjoy your morning cup of coffee with a view from one of the two decks. This home features an open concept living, dining and kitchen area great for entertaining or just relaxing. Sure to be a family favorite with a great layout and plenty of room to move around. The three bedrooms upstairs each have a door that leads out to the upper level deck. The downstairs area is perfect for just hanging out or cooking up something on the grill after a long day at the beach. Easy beach access via beach access road. Linens provided for an additional fee. Cute 3 bedroom home located in friendly family neighborhood in the heart of Crystal Beach near the Big Store, Waterslide and Crystal Beach Plaza for all your shopping needs. The beach is just a short golf cart or vehicle ride away. This home has many amenities to make your vacation memorable. This home has granite and stainless steel in the kitchen and is beautifully furnished. This home is sure to be a hit for your family! There is a 1/2 bath and shower located downstairs. Linens provided for an additional fee. Robyn's Nest is a 4 bedroom, 2 bathroom home that sleeps 13. 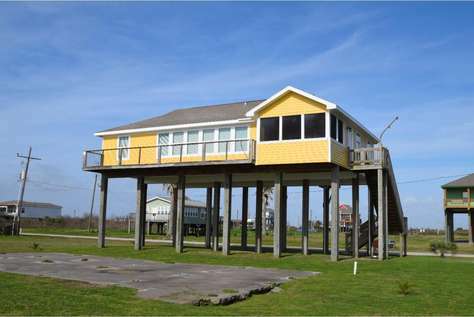 It is located in Port Bolivar. If you're looking for a quiet vacation away from the noise, with great views, this is the home for you! 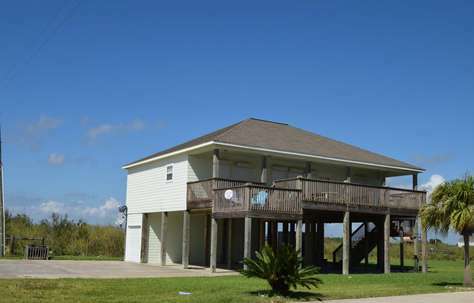 This is a waterfront home located directly behind the wetlands/Bolivar Flats It is a great area for birdwatching! The North Jetty is just down the road, so you're close to some great fishing. The beach is just a short drive away! You're minutes away from the ferry. If you'd rather stay inside, this home has wifi, satellite tv and roku in case you'd like to sign in to your accounts and finish your favorite shows. The kitchen has everything you need to cook your favorite meals. If you're looking for a tranquil setting, book your next vacation at Robyn's Nest! Linens available for an extra fee. There are 3 bunks. Each twin over full. This 3 bedroom, 2 bathroom home sleeps 9. It is in the popular Emerald 1 subdivision. This home is a short drive or walk to the beach. Clean off after a long day at the beach in the downstairs shower. Play a game of washers or horse shoes while you barbecue with your family downstairs. There is plenty of room in the living room to relax with your family after a long day at the beach. This will be the perfect home for your beach holiday! Linens available for an extra fee. This spacious, pet friendly home sleeps 12 is located in the family friendly Holiday Beach Subdivision. This home features a large open-concept living, dining, and kitchen area great for entertaining family and friends. Sunny Beach has all the amenities you are looking for in a beach home and then some including bamboo floors, granite countertops, large breakfast bar, spacious bedrooms, large master bath with a soaker tub or walk in shower, private deck off the master bedroom and comfortable furnishings. Enjoy your morning coffee or your afternoon cocktail on any one of the three decks. Relax downstairs in the shade while cooking up something on the BBQ grill. When you are ready for some fun in the sun, head to the beach. It's only a short walk, golf car, or vehicle ride away, via the beach access road. Linens provided for an additional fee. 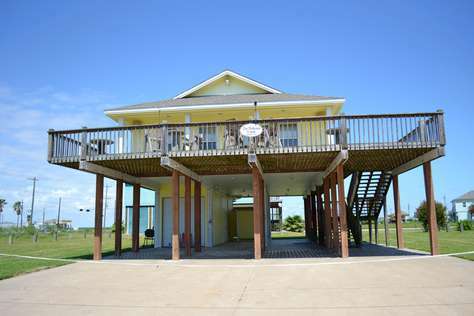 Sunset Treasures is a beautiful 3 bedroom 2 bath home that sleeps 10 and is located in a quiet family friendly area of Bolivar Peninsula. This home is sure to be a favorite beach get-a-way with its open concept living, dining and kitchen area. It features a gourmet kitchen with stainless steel appliances, granite countertops, custom cabinets and large breakfast bar. Sit and relax on the front deck and enjoy your morning coffee or the afternoon quietness this area has to offer. The downstairs area has a BBQ grill, large built-in picnic table and enclosed shower perfect for entertaining. When you are ready for some beach time, it's just a short golf cart or vehicle ride away, via the beach access road. Linens provided for an additional fee. Please note: This home is NOT available for prom or graduation parties/rentals. The Crystal Peach is a beautiful 3rd row, 3 bedroom 2 bath home that sleeps 10 and is located in the family friendly Sand Castle subdivision. You will love the tranquil relaxed open concept living, dining and kitchen area that has been beautifully decorated with stylish coastal décor and tons of natural light from the wall of windows making this the perfect beach retreat. This home features a gourmet kitchen with granite countertops, stainless steel appliances, custom cabinets and an extra-large island perfect for entertaining friends and family. Dine indoors or head out to the deck to dine al fresco with a beach view. Be sure to take advantage of the shaded downstairs area great for entertaining or relaxing, it is equipped with a bar area, BBQ grill, Picnic table and outside shower. When you are ready for some beach time, it's a short walk or golf cart ride away via the private neighborhood walkover. This home has amazing beach views. Sit outside in the morning with a cup of coffee and enjoy the sights and sounds of the ocean. PET FRIENDLY W/ non-refundable pet fee. Linens provided for an additional fee. The Escape is a 2 bedroom, 1.5 bath home in the Johnson Crawford area. It sleeps 6. 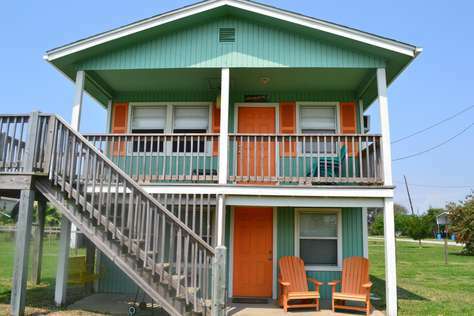 Book your family's escape to the beach in this cute home. This home is perfect for your small family and your budget! You'll love sitting on the deck and enjoying the amazing views! There's plenty of room in the kitchen to cook a great meal for your family. You could also head downstairs and barbeque on the and enjoy dinner on the picnic table. When you're ready to have some fun on the beach, it's just a short walk, golf cart or car ride away! This home has wifi and is pet friendly with a non-refundable deposit! Linens are available for an extra charge. The Hideout is a 3 bedroom 2 bath home that sleeps 9 and is located in the popular Ramada Beach subdivision. 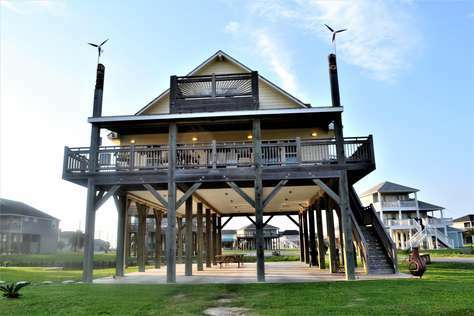 This home has all the amenities you could want while at the beach. It features an open concept living, dining and kitchen area perfect for the whole family. The Hideout has been tastefully decorated with a cool color palate, coastal décor and cozy comfy furniture making this a great beach get-a-way. Sit and relax on the deck with your morning coffee or your afternoon beverage of choice and enjoy the beach view. Be sure to take advantage of the shaded downstairs area perfect for entertaining or just relaxing. It is equipped with a BBQ grill, outside shower and plenty of space for a game or two of washers. When you are ready for some beach time, it's a short walk, golf cart or vehicle ride away via the beach access road. Linens provided for an additional fee. The Palms is a beautiful 4th row, 3 bedroom 2 bath home that sleeps 8 and is located in a great neighborhood near Gregory Park. This home is tastefully decorated with coastal décor, comfy furniture and a fireplace for gathering around on those cooler weather days/nights. The Palms features an open concept living, dining and kitchen area with a large breakfast bar perfect for the whole family. You will love sitting and relaxing on the deck with your morning coffee. The downstairs shaded area is perfect for hanging out, playing a game or two of washer and cooking up something on the BBQ grill. When you are ready for some beach time, this neighborhood has a private walk-over that is golf cart accessible. Linens provided for an additional fee. The Runaway - the perfect beach getaway for your family in the Bluewater subdivision. This 3 bedroom 2 bathroom home sleeps 10. This home has great views and is just a short walk to the beach! You'll feel right at home in this roomy home away from home. There is plenty of room your family to stretch out. Your family will enjoy their time outdoors both upstairs and down. Rinse off downstairs after a long day at the beach. Have a wonderful time at night during dinner, made in the beautiful kitchen, that opens up to the spacious and inviting living room. You'll want to run away to The Runaway for your beach vacation! Linens provided for an additional fee. This 2 bedroom/1 bathroom home sleeps 6. It is in the Sandy Shores subdivision. Are you looking for a cute beach home at an affordable price? This is the perfect home for you! Timeless Memoreez is located in a great neighborhood with beach access. The beach is just a golf cart ride, walk or short drive away! Sit outside under the covered deck in the morning with your coffee or lay out on the uncovered deck to get some sun. Wash off in the downstairs shower after a long day at the beach. Rinse your shells or fish in the downstairs sink. You're sure to make many memories during your stay at Timeless Memoreez! Waves of Change is in the Crenshaw subdivision. This homes sleeps 12! This 3 bedroom home is just a short walk or drive to the beach. You'll love spending your family vacation at this beautiful home. It has all the amenities you need! You'll love sitting on the deck in this quiet and family friendly neighborhood and enjoying the sights and sounds of the ocean.. Enjoy your dinner outside at either the upstairs or downstairs picnic table. Wash off in the outdoor shower after a fun day at the beach. Relax in the evenings in the cozy living room. Linens provided for an additional fee.